If you learn one thing on your way through Divinity: Original Sin 2, or The Witcher 3, or Baldur’s Gate, it’s that fantasy worlds tend to be dreadfully dangerous places. So what happens to all the adventurers who don’t make it to the happy ending? If you’re a bit squeamish about dead bodies, there are plenty of sims that don’t involve corpses. Check out our list of the PC’s best simulation games. Graveyard Keeper, from Punch Club developer Lazy Bear, is an answer to this question. In it, you’re the manager of a medieval cemetery, and your job is to make sure the dearly departed are given an appropriate final resting place. The trailer shows charming pixel art style, not unlike Stardew Valley’s – just significantly more macabre. Instead of farming crops, you’re conducting autopsies and planning burial plots, but it looks like there’s still a social element to the game. However, this is also quite a bit more grim this time around, as we’re treated to a burning at the stake at the behest of the local inquisitor, and at one point, an overworked gravedigger can be seen hurling a corpse into the river. 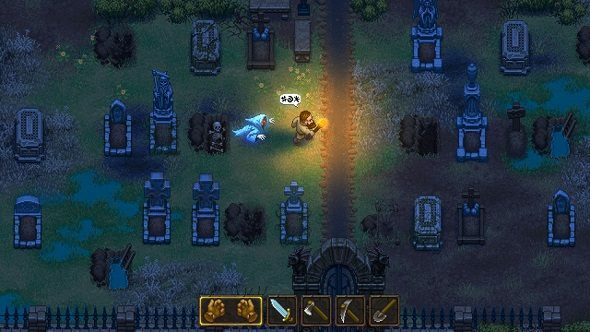 Lazy Bear is publishing Graveyard Keeper with tinyBuild Games, and it should be out later this year. You can check the game out on Steam.